There are two options available to the customers. 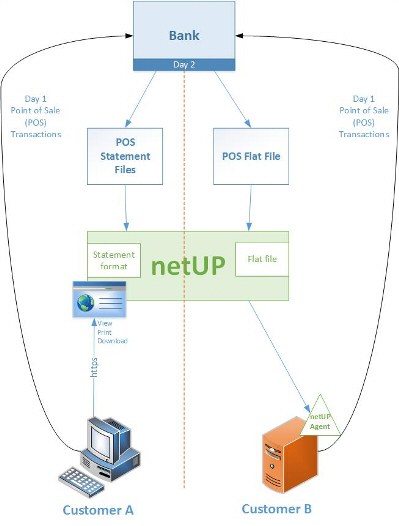 The first option is where netUP receives the information from the bank and formats it into a statement format for a customer. The customer will then log onto a web link that netUP provides and see all the successful transactions in statement format. The transaction information is sorted in specific criteria. This information can be viewed, downloaded or printed by the customer. The second option is for customers that have their own IT development teams and that only require the statement data of the successful transactions. For this purpose the customer needs to install a small netUP nuMotus agents and netUP will place the data, in flat file format, directly on the customers’ server for further processing by the customer. The transfer is encrypted at source and decrypted at destination. The totals displayed will correspond to the payments made by the bank to the customer for successful POS transactions and the details of the successful transactions that make up that amount is reflected accordingly. Please note that the credit card account number is masked and never visible anywhere. Enough details of the individual transactions are provided to enable a full match with original the point-of-sale (POS) transaction. What does the nuMotus nuView solution provide? By implementing the netUP nuMotus nuView Solution you will…..